Okay, it wouldn’t be much of a competition if I tried to run 22 miles, even if both of my legs worked, but in this annual competition in Wales, more than 630 runners and 60 horses compete (the initial race, in 1980 had 4 horses and 29 runners). This yearly competition in Wales attracts more than 600 runners and 60 horses. 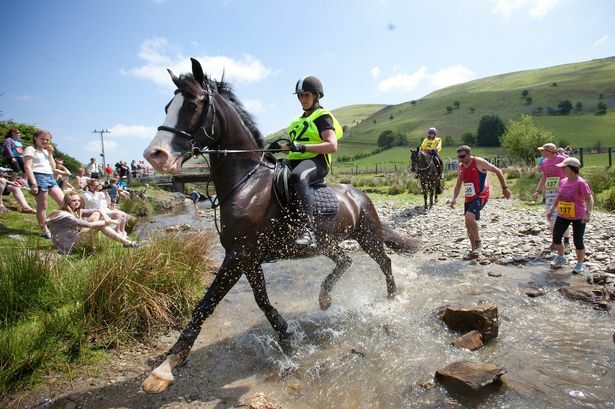 This yearly competition in Wales attracts more than 600 runners and 60 horses. [/caption]The competition started 37 years ago when Gordon Green, the manager of the pub in Llanwrtyd Wells, Wales was inspired to organize the race after listening to two customers debate whether a human could beat a horse under the right conditions and distance. So far, a human has won twice. But many times, the fastest human has surpassed the speed of many of the horses. And the payoff is pretty good. The purse is more than $32,000. There is one here in US as well…Man Vs Horse in Arizona that has been going on for years. Thank you. I’ll look into that one, too. Good to know. Its a brilliant event!! I took part with my Spanish horse back in 2013 and raised over £500 for charity. I am definitely looking to do it again in the future. It was such a great bonding exercise for horse and rider!! It does look like a lot of fun. I’ve heard there’s one in the US but too far away for me to participate. I guess I’ll need to organize one in New England.